When accuracy counts reach for Franford Arsenal's DS-750. This digital scale allows you to achieve maximum potential from your hand loads with 1/10 grain accuracy. Easy to use and intuitive with multiple features for ease of measurement. When accuracy counts reach for Franford Arsenal&apos;s DS-750. 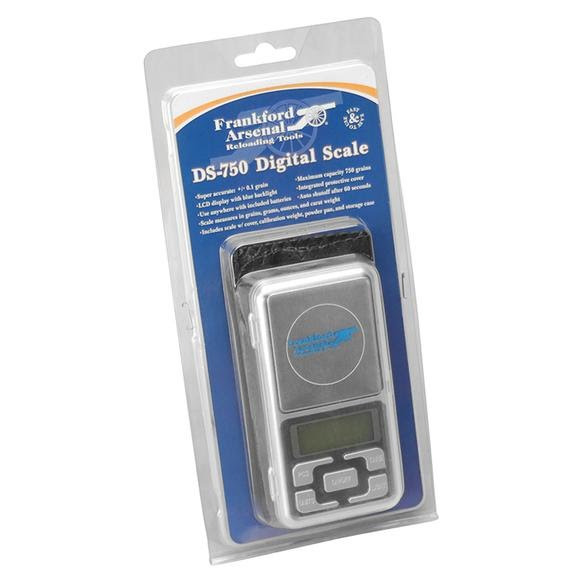 This digital scale allows you to achieve maximum potential from your hand loads with 1/10 grain accuracy. Easy to use and intuitive with multiple features for ease of measurement. Carry pouch holds scale, pan and calibration weights. Measures in: grains, grams, carats and ounces. Auto shutoff after 60 seconds. Power: 2 AAA batteries (included).